Annual Exhibition of the French Academy of Fine Arts. Ingres specialized in "academic art"
and its conservative approach to art. "Salon des Refuses" - "Salon des Independants" - "Salon d'Automne"
- Ecole des Beaux Arts, Paris. The Salon was the official art exhibition of the French Academy of Fine Arts (Academie des Beaux-Arts) in Paris. First held in 1667, its name stems from its location at the Salon Carre in the Louvre. For almost 150 years (c.1740-1890), the Salon was the most prestigious annual or biannual art event in the world. As a result, its influence on French painting - in particular artistic style, painterly conventions and the reputation of artists was enormous. A staunch upholder of the traditions of academic art, many of which dated from Renaissance times, the Salon became more and more conservative, and ultimately went into a serious decline. Two of the most famous 'academic' artists were Nicolas Poussin (1594-1665) and J.A.D. 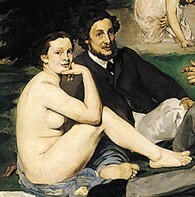 Ingres (1780-1867), whose line-based style of painting was opposed by their respective contemporaries Rubens (1577-1640) and Delacroix (1798-1863). In 1881, the French Academy relinquished control of the Salon, in favour of the Society of French Artists (Societe des Artistes Francais), although the Salon remained hostile to the avant-garde. Today, the yearly Salon is merely one of several other fine art 'Salons' - such as the Salon d'Automne and the Salon des Independants. The first 'Salon' exhibitions were held in a variety of places, and only members of the Royal Academy of Painting and Sculpture (Academie Royale de Peinture et de Sculpture) - or its school (Ecole des Beaux-Arts) could exhibit. It moved to the Salon Carre in the Louvre from 1725, after which it became known as the Salon de Paris, and from 1737 any artist could exhibit, if approved. For some years however, the frequency of these fine art shows was irregular, being annual or biennial, but once regularity was established, the Salon's status became unmatched by any similar art exhibition, and was visited by all serious art collectors, dealers, curators and patrons. In 1748 a jury - typically recruited from members of the Academy - was introduced to determine which paintings and sculptures should be exhibited, further enhancing the Salon's stature. The French revolution opened the Salon to foreign artists, making it even more prestigious, if somewhat crowded. By 1820, the Salon had become a major annual event. It was now staged in large commercial halls, packed floor-to-ceiling with paintings - a feature which itself led to the formation of a Hanging Committee to determine which canvases were displayed at what level - viewed by thousands of ticket-bearing visitors. In 1849, a number of medals and awards were instituted, while art critics in the Parisian Gazettes and other newspapers ran numerous reviews and articles on the works of art displayed. The mid-19th century was probably the highpoint of the Salon's influence on European art. Thereafter, despite some attempts to widen its horizons - such as its welcome for Orientalist painting - the conservative philosophy of the Salon succeeded in progressively undermining the judgement and reputation of the organization. An uproar occurred in 1863, following the rejection by the Salon Jury of an unusually high number (3,000) of submitted paintings, including Dejeuner sur L'Herbe (1863) by Edouard Manet, and works by Whistler, Cezanne, and Camille Pissarro. To pacify the critics and "to let the public judge the legitimacy of these complaints", French Emperor Napoleon III announced that painters whose works had been rejected by the Salon Jury could exhibit their works in a venue next to the Salon. The show famously became known as the Salon des Refuses (exhibition of rejects), a name subsequently applied to any exhibition of artworks rejected by the jury of the official Paris Salon, notably shows in in 1874, 1875, and 1886. Although in 1863 the rejected works were subjected to greater criticism by the art critics, the very existence of this 'alternative' exhibition undermined the exclusivity of the official Salon. Henceforth, artists began organizing their own shows (notably the Impressionists in the 1870s and 1880s), and many art historians date the beginning of Modern Art to the first Salon des Refuses. The institution of the Salon des Refuses, the ongoing conservatism of the French Academy, and the reluctance of the Salon Jury to accept paintings by avant-garde movements like Impressionism, gnawed away at the reputation of the Salon and greatly diminished its importance. In 1881, the French School of Fine Arts (Ecole des Beaux-Arts) gave up control of the Salon, which passed into the hands of a newly organized group known as the Society of French Artists (Societe des Artistes Francais). The group aimed to maintain the general conservatism of the French Academy, to which end it reintroduced the Jury system (members being drawn from the previous years' exhibitors) and continued to frown on the avant-garde. In December 1890, the leader of the Society of French Artists, William-Adolphe Bouguereau (1825-1905), proposed that the Salon should be an exhibition of young artists who had not yet been accepted into the show. This radical proposal was emphatically rejected by another faction - including the likes of Ernest Meissonier (1815-91), Pierre Puvis de Chavannes (1824-98) and Auguste Rodin (1840-1917), among others - who formed a conservative breakaway group known as the National Society of Fine Arts (Societe Nationale des Beaux-Arts) with its own annual art show. Referred to in the newspapers as the Salon du Champ de Mars, or the Salon de la Societe Nationale des BeauxArts, it soon became known as the Nationale. Meanwhile, the first major rival to the Paris Salon had already appeared, back in 1884. This was the Salon des Independants, organized by the Society of Independent Artists (Societe des Artistes Independants) a group founded by Odilon Redon (1840-1916), Georges Seurat (1859-91), Paul Signac (1863-1935) and others. Authorized by the Ministry of Fine Arts, and allocated rooms by the Parisian municipal authorities, this group's Salon had no jury to vet submissions, which meant any artist could exhibit on payment of a fee. Its first exhibition, held May-July 1884, contained over 5,000 works by more than 400 artists. Its second show, held in 1886, was even bigger, and from then until the outbreak of war in 1914, the Salon des Independants was the trend-setting Salon in Paris and the centre of the avant-garde. It became the principal showcase for Neo-Impressionism, and Post-Impressionism and other modern art movements, and its exhibitors have included Archipenko, Giorgio de Chirico, Giacometti, Kandinsky, Kazimir Malevich, Joan Miro, Piet Mondrian, Edvard Munch, Henri Rousseau (Le Douanier), Alfred Sisley, Toulouse-Lautrec, Van Gogh, and Edouard Vuillard, among many others. Based, since 1920, at the Grand Palais (close to the Societe des Artistes Francais, the Societe Nationale des Beaux-Arts, the Societe du Salon d'Automne, and others), it remains one of the leading Salons in Paris. The Autumn Salon was an annual exhibition set up in 1903 as a progressive alternative to the official Salon, and a more discriminating alternative to the Salon des Independants. Organized by the Societe du Salon d'Automne, and held in October/November to avoid clashing with other shows, its early exhibitions helped to establish the reputations of both Paul Cezanne (1839-1906) and Paul Gauguin (1848-1903), while its 1905 show became famous for its launch of the revolutionery colourist style known as Fauvism, featuring Fauvist painters like Henri Matisse (1869-1954), Georges Rouault (1871-1958), Andre Derain (1880-1954) and Maurice de Vlaminck (1876-1958). Other famous artists associated with the Salon d'Automne have included painters such as Renoir (1841-1919), Picasso (1881-1973), the Montparnasse group including Amedeo Modigliani (1884-1920), Georges Braque (1882-1963) and Marc Chagall (1887-1985), and sculptors like Aristide Maillol (1861-1944), Constantin Brancusi (1876-1957), and Ossip Zadkine (1890-1967). Decorative art was also shown, including Art Nouveau glassworks by the French jeweller Rene Lalique (1860-1945) and architectural designs by Le Corbusier (Charles Edouard Jeanneret) (1887-1965). The Salon thrives to this day. As you can see, the 'Paris Salon' has multiplied over the years. Today, in the 21st century, in addition to the Salons listed above - run by the Societe des Artistes Francais, the Societe Nationale des Beaux-Arts, the Societe des Artistes Independants and the Societe du Salon d'Automne - other outlets for new fine art in Paris include the Salon de Mai, Salon de la Jeune Peinture, and the Salon des Realities Nouvelles, among others. Important cutting edge shows of avant-garde painting and sculpture can also be seen in the Museum of Contemporary Art at the Pompidou Centre.